Add a unique edge to your marketing campaign! We offer you a new technology platform to sell real estate online differently & efficiently. No more waiting at open for inspections to speak to buyers; we instantly match and connect you with ready buyers whose requirements match your property for sale, whether your property is advertised or being sold off-market. We give you the contact details of all matched buyers (phone numbers & email addresses). So Property Whispers is very different to any other platform and adds a unique edge to your marketing campaign. Our listing fee is far, far cheaper than any other platform. Agents have a free trial...and our buyers could be your new listing! Selling without an agent? We make it easy for you too! "The tool is incredibly powerful and amazingly user friendly.. I use it as a listing tool, a place for my vendors to test the market passively before launching a full scale campaign"
"An awesome start...I put up my first property and received 41 matches!" "In the short time I have been registered on Property Whispers I have had a very positive experience. Over 100 new buyers I didn't know previously now added to my database!" What listings are suitable for Property Whispers? Both properties that are being 'publicly advertised' and those that are being sold 'off-market' are suitable for listing on Property Whispers. A 'quiet' listing - a property for sale (by private treaty or expressions of interest) that is not publicly advertised. A 'pre-market' listing - a property for sale (by private treaty or expressions of interest) before the public advertising campaign commences. Off-market listings are sometimes referred to as silent listings, quiet listings or pocket listings. 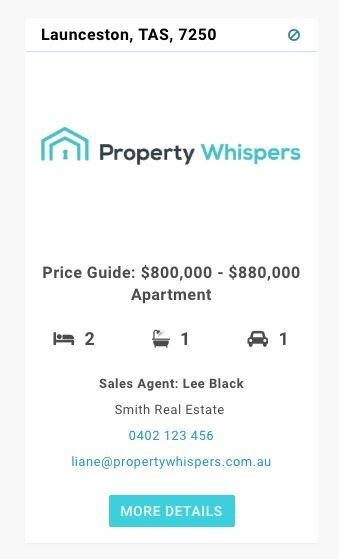 What are the benefits of using Property Whispers? To be put in direct contact with registered buyers who have purchase requirements that specifically match the property you have available for sale. By accessing more buyers, there is the potential to create a more competitive slaes environment and sell your property in a shorter period of time. Is Property Whispers operating nationally? Yes, we operate nationwide, with the bulk of our buyers and properties in major metropolitan areas. What information is required to upload an off-market property? For 'off-market' properties only, the street address is NEVER PROVIDED to buyers, only recorded on your personal "Dashboard". Buyers are only ever made aware of the suburb. Photos and description of the property are optional. A picture paints a thousand words! Buyers love to see photos so if you are happy to provide photos that will help them decide whether it suits their requirements and whether it is worth arranging to view the property. This can save you both time. Smartphone quality is absolutely fine. When taking photos where possible take when there is plenty of natural light and take from the corner of a room to show the full size of the room and its proportions. As the owner, let buyers know what you love about the property and its location, its best attributes and features, as well as practical information such as land size, house or unit size, council and water rates, how many units there are in a block, strata fees, etc. Agents may also upload their company logo in their Profile which is seen on all property matches. An example of what a buyer receives when there is a match is seen below. If 'More Details' is clicked the description and photos are revealed (if provided). How does Property Whispers differ from other property sale websites? There is no 'browsing" on Property Whispers, only instant matching of advertised and off-market properties with buyers’ purchase requirements. Once a match occurs, both buyer and agent or seller are sent each other's contact details. How long can my property stay listed on Property Whispers? A property can be listed for up to 6 months. If you wish it to remain on Property Whispers longer, a new listing fee will apply. Who will be given my contact details? Buyers who have registered with Property Whispers and have property requirements that match your property listings. Contact details provided are your name, company, email address and mobile number. How am I notified of a match and how do I contact the buyer? Details of the buyer/s appear instantly on your Dashboard when you click on 'Buyer Matches'. You can call or email a buyer to discuss the property. An example of what you see is below..
An email notification is also sent every day to matched buyers and sellers alerting of new matches. In the email you receive the buyer's contact details ie. name, email address and phone number. Is there a cost to register with and use Property Whispers? Agents get 3 FREE property uploads to use within 60 days of registration. Thereafter it costs $99+GST to upload a property. For Private Sellers there is a cost of $139+GST per property. All property uploads are valid for 6 months. Buyers register and use the website for free. How does Property Whispers ensure that properties listed as 'off-market' are genuinely for sale 'off-market'? requires real estate agents to hold an Agency agreement and Contract of sale for any off-market property uploaded to the site. Agents are required to specify the street address of any off-market property uploaded. Note: The street address is never given to buyers, they are only given the suburb. Only properties meeting the criteria will be permitted to stay on the website. How does Property Whispers keep its buyer database current?